Premium Woven Wood Shades is a superior class of natural shade which combines artistic style and high quality woods and reeds with a unique array of color, grain and texture. 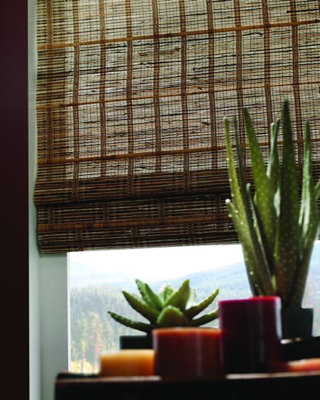 The natural materials of the Woven Shade softly filters the sunlight to maintain a natural, exotic appearance. Standard wood headrail 5/8" x 1 1/2"
Please note that due to variations in computer monitors and printers, we cannot guarantee the accuracy of colors shown. 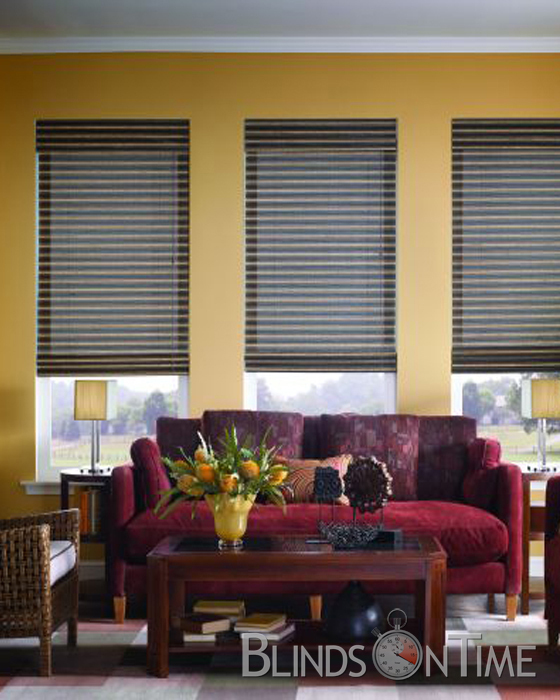 Order select samples online to view our complete window treatment collection. Banding will be sewn on both sides and across the bottom of the shade, and on the sides and bottom of the valance. Banding is made of same material as our cotton/twill tapes. 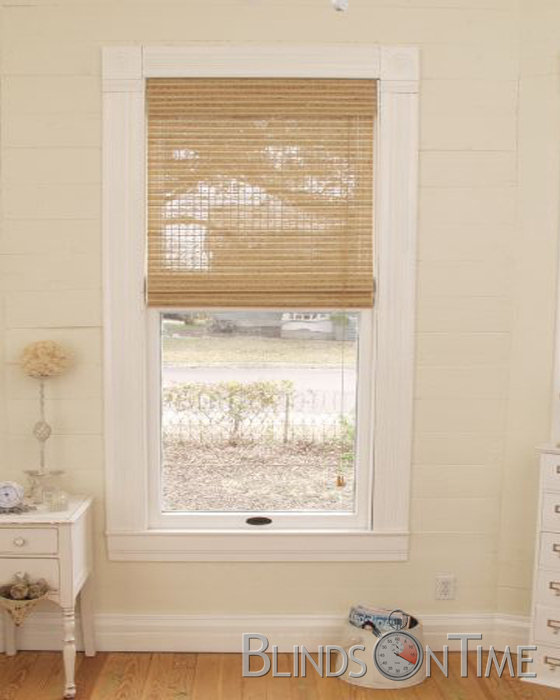 Available on natural weave shades including specialty items with surcharge. There are no size or application restrictions. Not available on Top Down/Bottom Up. Type in the room and window location for this shade. This information will help to match the shade with its window. Inside mount means the blind or shade is installed within the window frame, leaving the outside frame exposed. Outside mount is a window covering that is mounted outside of the window frame, either on the flat surface (moulding) or in some cases on the wall. Where you want the cord to be placed on the shade, left side or right side? Standard Rectangular This cord lock shade allows you to raise and lower the shade by pulling on the single cord. Shade may be stopped at any point. Waterfall Waterfall shades are made with material attached to the front of the wood with a valance attached to the back of the wood headrail to hide components. The lift cord will be behind the material. Top Down Bottom Up (Duofold) This system allows you to raise the shade from the bottom up or lower the shade from the top down. Continuous Cord Loop This is a continuous cord loop operating system. The cord loop is pulled in a circular motion to raise or lower the shade. Use multiple shades on one headrail to accommodate wide windows or patio door that can't be covered by a single window treatment. A single headrail makes installation easier and adds a unified look to up to three independently operable window treatments. Woven Wood Liner Now you see it…now you don't Customers love the open airy look of woven woods, but often pass them up as an option because of privacy concerns. Standard liners solve the privacy issue but are permanently attached and eliminate the breezy look. Vista has solved the problem with our new integrated/operable pleated liner! This patent pending idea incorporates a pleated shade liner that is attached to the woven wood headrail. (Since there is not a separate headrail for the liner it does not require any additional depth clearance.) The liner operates independently of the woven wood shade, allowing the customer to have that tropical look and feel plus privacy on demand. Please check all your selections and options for accuracy. You may see all your selections by clicking the "Review" tab on the left side of the product image. If you specify a quantity more than 1, the same colors, sizes and options will be applied to entire quantity. So if you need other shades with the different sizes, choose quantity of 1 and then customize others. I am adding this blind to a previous order and very pleased with the product.